Hydro sulfuric acid, also known as hydrogen sulfide or dihydrogen sulfide, is a colorless gas that has the smell of rotten eggs. Hydrogen sulfide is known for being toxic, flammable, and corrosive. 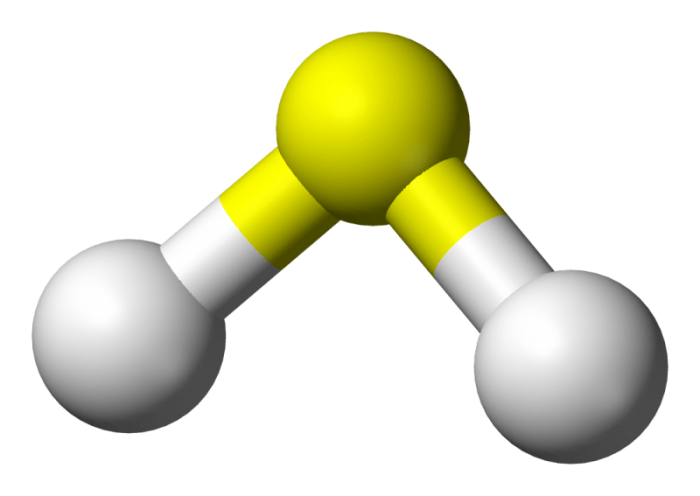 The chemical formula for hydrogen sulfide is H2S. Appearance: Hydrogen Sulfide is a completely colorless gas. Distinguishing Characteristic: Smells like rotten eggs. Hydrogen sulfide is made out of two hydrogen atoms and one sulfur atom. Hydrogen sulfide is denser than regular air, and when burned with oxygen it produces a blue flame. The burning of hydrogen sulfide produces water and sulfur dioxide. Hydrogen sulfide acts as a reducing agent, a compound or element that sheds an electron to a different chemical during the course of a redox chemical reaction. When combined with catalysts or at high temperatures, hydrogen sulfide and sulfur dioxide will react with one another to form water and sulfur. This reaction is utilized to dispose of hydrogen sulfide in industrial operations. Hydrogen sulfide functions as a weak acid, and it is water-soluble, though not heavily water-soluble. When combined with air, the solution will oxidize and create sulfur, which isn’t water-soluble. 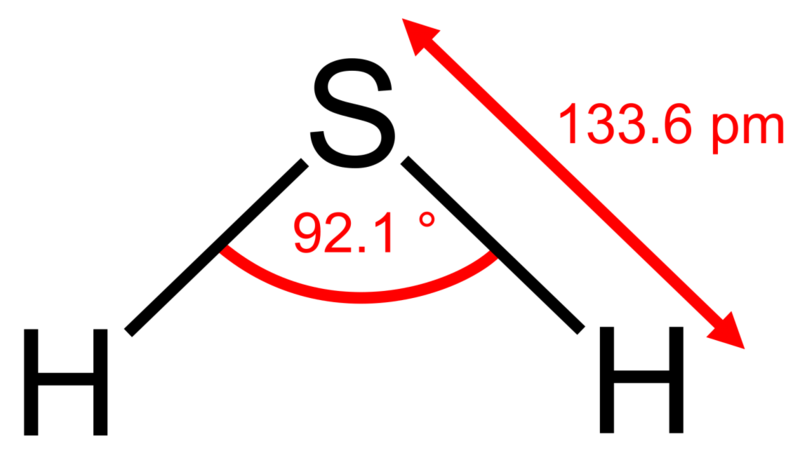 Although hydrogen sulfide has a structure similar to water, sulfur has nowhere near the level of electronegativity that oxygen does, meaning that hydrogen sulfide is much less polar than water. Due to hydrogen sulfide’s less polar nature, the melting and boiling points for hydrogen sulfide are substantially lower than water’s boiling point. Hydrogen sulfide boils at -60.7°C while water boils at 100°C. Pure hydrogen sulfide is colorless and so are solutions containing it. Hydrogen sulfide forms metal sulfides when it reacts with metal ions. These metal sulfides are usually dark in coloration and they are water insoluble. If metal sulfides are treated with a strong acid they free up hydrogen sulfide. When pressurized above 90 gigapascals the molecules of hydrogen sulfide are able to conduct electricity. High-pressure hydrogen sulfide exhibits superconductivity when it is cooled down below a critical temperature. As pressure increases, the critical temperature also increases. The critical temperature for hydrogen sulfide is somewhere between 23K at 100 gigapascals and 150 K at 200 gigapascals. Hydrogen sulfide’s odor is so potent that it can be detected at levels of around 2 ppb. As a reference, a concentration of 20 ppb would be 1 mL of the gas evenly distributed in a 100 seat college lecture hall. Hydrogen sulfide is usually produced by separating out the molecules from sour gas, and sour gas is just natural gas that has high concentrations of hydrogen sulfide within it. However, nitrogen sulfide can also be created by combining molten sulfur with hydrogen at a temperature of approximately 450°C. Hydrogen can be gained from hydrocarbons during this operation. Sulfate-reducing bacteria also produces hydrogen sulfate as a waste product. These bacteria create energy in low oxygen environments by using various sulfates to oxidize hydrogen or various organic compounds. Another method of producing hydrogen sulfide is liberating it from nonmetal and metal sulfides like phosphorus sulfide and aluminum sulfide, which can be done by exposing the sulfides to water. Hydrogen sulfide gas can be obtained more easily from sulfite if water heaters are used, thanks to the fact that a sustainable warm environment is created for the sulfur bacteria that will produce the hydrogen sulfide. Natural gas can be comprised of up to 90% hydrogen sulfide, which makes the collection of natural gas one of the primary methods of obtaining hydrogen sulfide. Hydrogen sulfide can also be found in smaller amounts in crude petroleum. Some natural hot springs and volcanoes also emit large amounts of hydrogen sulfide, likely the product of hydrolysis. Sulfate-reducing bacteria can also create hydrogen sulfide in well water. Petroleum refineries are the largest industrial source of hydrogen sulfide. Hydrogen sulfide is capable of being generated by the cells of the body, through either non-enzymatic or enzymatic pathways. Although most hydrogen sulfide produced inside the body is made in enzymatic pathways, nonenzymatic pathways use proteins like Rieseke proteins and ferredoxins to create hydrogen sulfide. The human body creates hydrogen sulfide in small doses by breaking down proteins with sulfur in them. Hydrogen sulfide is mainly utilized as a catalyst to obtain elemental sulfur. Hydrogen sulfide is used in the production of a handful of different organosulfur compounds including ethanethiol and methanethiol. When hydrogen sulfide is combined with alkali metal bases, it converts into alkali Hydrosulfides like sodium Hydrosulfide and sodium sulfide. One of the primary uses of sodium sulfide and other alkali Hydrosulfides is in the process of paper marking. Many metal sulfides are created through the combination of metal ions and hydrogen sulfide. The uses for this metal sulfide conversion include cleaning contaminated water or gas. Hydrogen sulfide is often used to treat mineral powders and to encourage the separation of metal ores during the process of flotation. Hydrogen sulfide gas is capable of staving off mitochondrial damage when applied to cells in small amounts. Hydrogen sulfide is also frequently used to separate out heavy water, or deuterium oxide, from regular water. 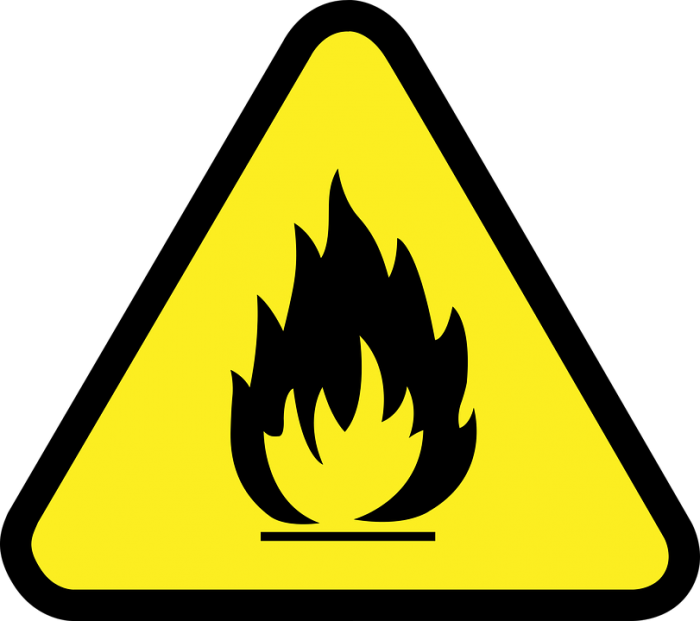 Hydrogen sulfide is flammable, sometimes explosive, corrosive, and toxic. Hydrogen sulfide can damage many different systems and organs in the body, as it is a broad-spectrum poison. However, hydrogen sulfide tends to affect the nervous system the most severely. Hydrogen sulfide poisoning is comparable to carbon monoxide poisoning in terms of damage, and it similarly prevents cellular respiration. Because the body naturally produces hydrogen sulfide, the body also has several enzymes that detoxify it, present within the gut. Hydrogen sulfide is thought to start doing substantial damage to the body around 50 ppm, and 20 ppm is the acceptable ceiling concentration according to the Occupational Safety Hazard Association. Because hydrogen sulfide is heavier than air, it frequently accumulates in poorly ventilated areas, congregating along the floor in deadly concentrations. Low concentrations of hydrogen sulfide can cause problems like shortness of breath, pulmonary edema, cough, sore throat and eye irritation. These symptoms usually resolve themselves within a few days to weeks. However, even lower levels of hydrogen sulfide exposure over the long-term can result in headaches, poor memory, dizziness, and fatigue. Severe pulmonary edema, loss of breathing, and possibility of death can occur at concentrations of over 300 ppm. Hydrogen sulfide is one of the primary constituent chemicals in the sulfur cycle, which refers to the abiotic and biotic pathways that cycle sulfur through the earth. 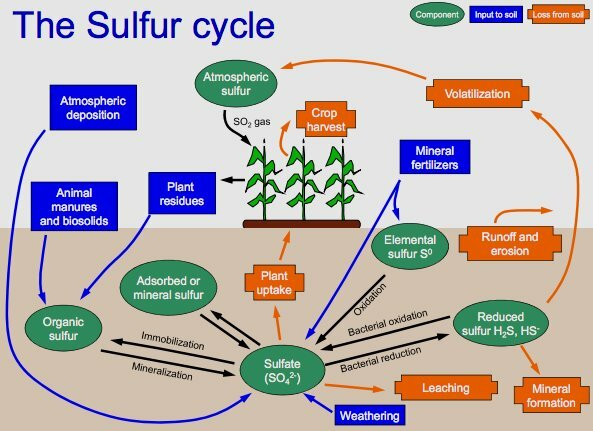 There are four phases of the sulfur cycle. The first phase involves the creation of inorganic forms of sulfur, like hydrogen sulfide, out of organic sulfur. 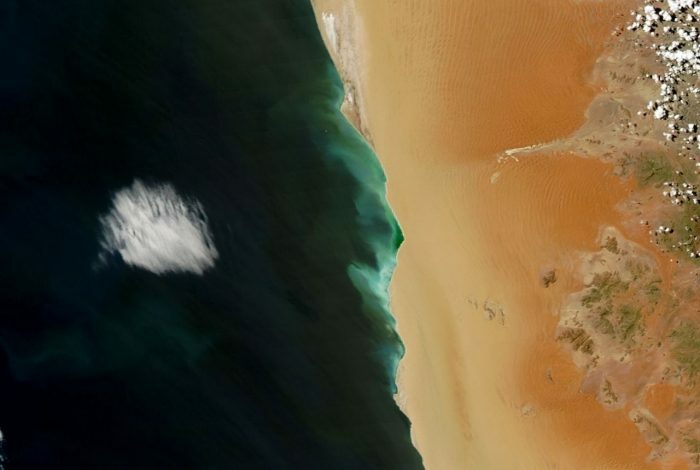 The second phase involves the oxidization of those inorganic forms of sulfur, with sulfide, elemental sulfur, and sulfate being oxidized by purple and green sulfur bacteria. After this, there is a reduction of sulfate into sulfide, specifically dissimilative sulfur reduction. Finally, sulfide is incorporated into a variety of different organic compounds which include sulfide derivatives that contain metal. When organic matter decays in conditions of low oxygen, bacteria that reduce sulfur or sulfate will use the sulfates present in the environment to oxidize and degrade this organic material. This process produces hydrogen sulfide as a byproduct. This hydrogen sulfide goes on to form metal sulfides by combining with metal ions. Meanwhile, other forms of bacteria strip hydrogen sulfide from amino acids that contain sulfur. Green sulfur bacteria and purple sulfur bacteria produce elemental sulfur by utilizing hydrogen sulfide as an electron donor during the process of photosynthesis. While most animals are damaged by exposure to hydrogen sulfide, a few species of extremophiles are able to live and thrive in sulfide-rich environments. For example, a number of bacteria and fish live around hydrothermal vents that expel hydrogen sulfide. Similarly, there are freshwater springs that have high hydrogen sulfide levels, and these springs are home to a handful of fish species and invertebrates. Previous Post« Previous How Far Is A Klick In Distance?